Abstract: On the account of its compact size, a few of buyers and those inclined to buy it feel barely secure about its performance of climbing. By means of potent performance, it is a piece of cake for Airwheel X5. The electric self-balancing scooter are prevalent both at home and abroad as a new generation of alternative to personal transporter. On the account of its compact size, a few of buyers and those inclined to buy it feel barely secure about its performance of climbing. Days ago, a video posted online showed an Australian youngster steered electric self-balancing scooter, which proves the potent performance of climbing. 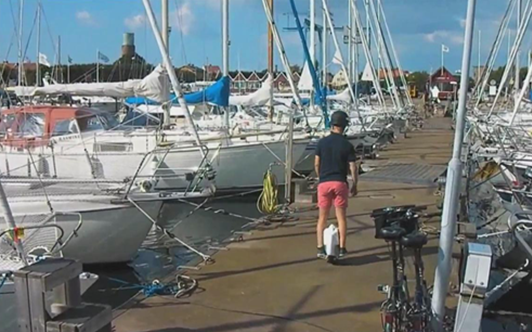 In video, the Australian youngster steered Airwheel X5 at the dock. The path at the dock was a bit unlevelled, but Airwheel X5 scooted steadily. With the high-quality and durable tyre mounted, Airwheel X5 never flinched from unlevelled path. For a start, he cycled through a gentle slope. By means of potent performance, it is a piece of cake for Airwheel X5. Airwheel X5 is equipped with a lithium core battery and adopts the gyroscope system according to the aerospace system control theory and fuzzy software algorithm. These technologies ensure the ease of keeping balance. In process of steering, the Australian youngster enthralled a great many of by-passers. Chic and sleek, Airwheel X5 has an air of state-of-art technology. Hence, steering Airwheel electric scooter comes as a trendy exercise. It is always catching pedestrians’ eyes. The stretch of level path gave up to a stretch of steep slope with as much as 30°. But Airwheel X5 covered through it without any effort. This means that Airwheel electric scooter applies to paths of all description in the city. The fact speaks louder. 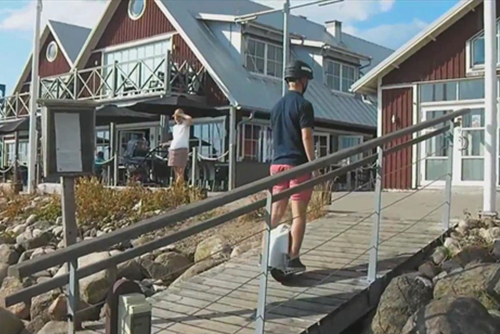 The Australian youngster demonstrated the powerful performance of Airwheel electric scooter. Airwheel electric scooter is your optimal choice.